A middle office is the group of employees in a financial services company or hedge fund that manages risk, calculates profits and losses and often is in charge of information technology. The middle office draws on the resources of both the front and the back offices. A financial services company is logically broken up into three parts: The front office includes sales personnel and corporate finance; the middle office manages risk and IT resources; and the back office provides administrative, support and payment services. Middle and back office jobs are generally non-revenue producing but are essential to managing risk and ensuring that transactions are executed correctly. They are considered an essential part of a company's infrastructure. In the early days of foreign exchange and investment banking, responsibilities were usually split solely between the front office and the back office. The front office personnel were the sales people, traders and deal makers. Most had college degrees (with the exception of some foreign exchange traders) and many had MBAs, while the back office personnel were only required to have a high school diploma. As transactions and technology have gotten more complex, the middle office functions have developed and split off from the back office. These employees usually have at least a bachelor's degree, and an increasing number have either an MBA or a master's degree in technology. Middle office personnel are closely involved in ensuring that the deal negotiated by the front office is what is actually booked, processed and paid for. This can include managing a wide range of International Swap Dealers Association (ISDA) agreements; tracking deals' profits and losses; risk management; and ensuring that all required compliance documents have been completed. Some firms have specialized legal support teams that are part of the middle office. 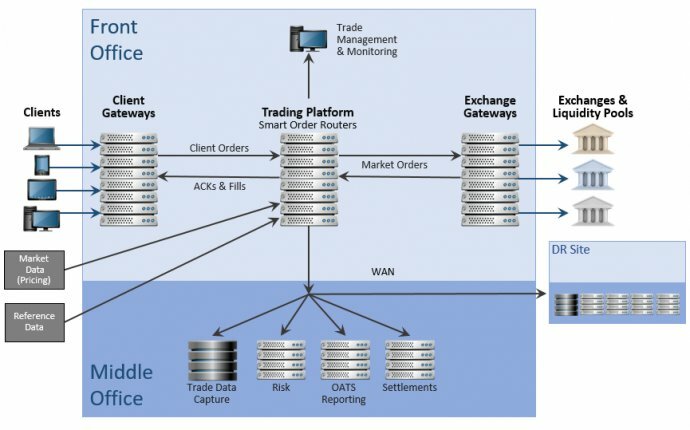 IT middle office functions run the gamut from ensuring that paying and receiving functions are operational to designing software to implement trading strategies. IT middle office personnel also manage contracted software systems that are used for trading, such as Bloomberg and Reuters 3000. They support both the front and back office, and are often on call 24 hours a day, seven days a week to ensure that essential market data is being constantly captured and monitored.